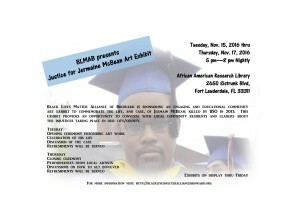 The Alliance’s next mobilization for Jermaine McBean is The (In)Justice for Jermaine Art Show, a performance and visual art exhibition Tuesday, November 15 through Thursday, November 17th, from 6-8 pm each night, at the African American Research Library and Cultural Center in Fort Lauderdale. The Alliance seeks visual and performing artists to submit creative pieces and/or performances that help us bring attention to the life, killing and case of Oakland Park resident, Jermaine McBean. The goal of (In)Justice for Jermaine McBean Art Show is to engage local community residents and leaders around conversation in Jermaine’s case as well as injustices around the country. The exhibit will feature photos and memorabilia from Jermaine’s family and friends, poetry and performances from local artists, artwork that brings life to the case, and an educational session with the family’s lawyer. On July 31, 2013, Jermaine was walking home with an unloaded air rifle that he just purchased from a local pawn shop in Oakland Park. Someone saw a black man with a rifle and called the police. 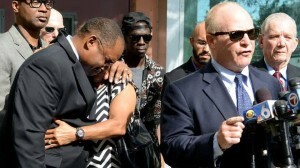 Broward County Sheriff’s Deputy Officer Peter Peraza shot Jermaine dead. Peraza later claimed that he made multiple requests for McBean to drop his weapon and only shot and killed him after McBean pointed the weapon at him. The entry angle of the fatal bullets did not support the story that McBean was pointing the gun at Peraza and other officers. The police officers that were on the scene claimed there were no earbuds in his ears at his time of death. However, a photo was uncovered last year showing McBean wearing earbuds at the time he was killed and in the corner of the picture you can see the feet of a police officer hovering over his dead body. A few months later Officer Peraza was awarded a medal by BSO Sheriff Scott Israel for killing Jermaine, and he successfully used Florida’s “Stand Your Ground” Law in his court defense, resulting in a dismissal in July. The opening night of the exhibition will include members of the McBean family as well as their attorney (prominent civil rights attorney David Schoen), who will detail the aspects of the case, as well as discussion about what can we as citizens do to bring change to this and other shootings. Performances are planned each night of the three day exhibition.